Food in Japan is amazing due its quality and care for the craft. Dining in the large cities can be a first class experience. Fresh ingredients and incredible service highlight why food in Japan is regarded highly by foodies all over the world; incredible service is an understatement BTW. Not only is there a wide selection of Japanese food in Japan (obviously), there is a surprising amount of international cuisines as well. Chinese, Korean, Italian, French, and Indian restaurants are particularly popular. International food in Japan has inspired the Japanese to create their own versions of foreign dishes, which end up being deliciously unique. Here are some helpful descriptions of common Japanese foods to get you started. Sushi is raw fish, vegetables and/or other items served with vinegar-seasoned rice and seaweed. Sashimi is raw fish that is served only with soy sauce and wasabi (Japanese horseradish). 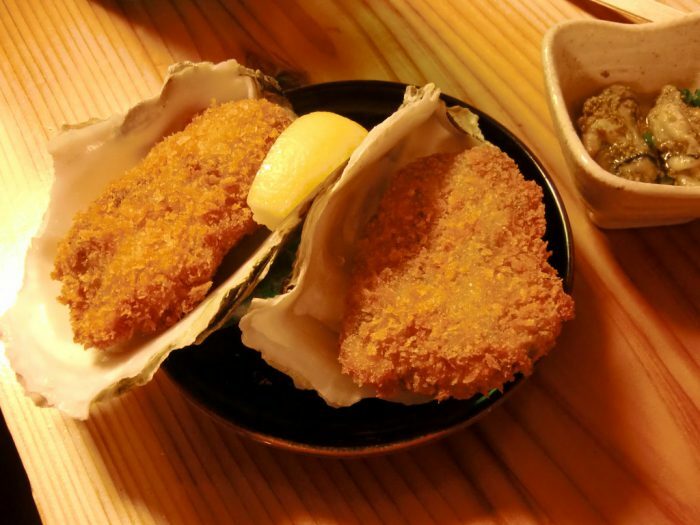 Pork cutlets that are breaded and then deep fried. It is served with finely sliced cabbage, karashi (Japanese mustard) and tonkatsu sauce, which is slightly sweet and similar to worcestershire sauce. Seafood, especially shrimp, and select seasonal vegetables that are deep fried in a very light batter. Tempura tastes best when eaten fresh. Yakitori are small pieces of chicken that are cooked over a grill on skewers. You can choose to have it cooked with salt or sauce. Yakitori is a popular pub food and tastes great with beer or sake. Ramen is a very famous Japanese noodle soup. There is an endless variety to choose from. Different areas are known for their own original varieties of ramen. People travel long distances and wait in long lines to eat at the most popular ramen shops. Shabu-shabu are thin slices of meat that you cook yourself at your table by quickly dipping it into a pot of boiling water or konbu (kelp) stock. Once cooked you can dip your meat in ponzu (a citrus soy sauce) or sesame sauce. It is a fun, family style meal. Sukiyaki is a nabe (hot pot) dish. Thinly sliced beef, vegetables and tofu are slowly simmered in a sauce that is made from soy sauce, sugar, sake, and mirin (sweet rice wine). Vegetables and seafood and/or meat are piled on top of a pancake-like batter and cooked on a hot plate. It is topped with a dark sauce, powered seaweed and katsuobushi (dried bonito flakes). It is prepared slightly differently depended on your location. In Osaka, they mix all the ingredients together. In Hiroshima, it is layered and also usually has noodles. In Tokyo, they have a softer version which is called monjayaki. Soba are thin buckwheat noodles. It is served cold with dipping sauce or with hot soup. Soba is even tastier when you add toppings. Some common toppings are egg, wakame (seaweed), tororoimo (yam), and tempura. After eating your noodles, you can enjoy the sobayu (soba soup). Udon is a thick, wheat noodle. Udon is usually served in a hot, soy-based soup with your choice of toppings. Common toppings include wakame (seaweed), deep fried tofu, and tempura. Unagi is freshwater eel, which is different from anago (saltwater eel). Unagi is grilled with a special sweet soy sauce and served over rice. In some areas the eel is steamed before grilling. It is a very nutritious dish and is known to restore stamina during the hot summer days. Oden is a winter dish that is sure to warm you up. Various ingredients including eggs, daikon (Japanese radish), and fish cake are slowly stewed in a light broth. Gyudon literally means “beef bowl”. This is popular and very hearty dish. It is a bowl of rice topped with beef and onion that is simmered in a mildly sweet sauce. It is seasoned with soy sauce, mirin (sweet rice wine), and dashi (fish and seaweed stock). You can have it topped with a raw egg, if you like. It often comes with pickled ginger, shichimi (ground chili pepper), and a side of miso soup. Takoyaki is a ball-shaped snack made of a wheat batter. it is filled with minced or diced tako (octopus), tenkasu (bits of tempura), picked ginger, and green onion. It is cooked in a special takoyaki pan and topped with a brown takoyaki sauce, similar to worcestershire sauce, and mayonnaise. Nabe is a hot pot dish. Meat, vegetables, tofu, and other ingredients are all cooked together in one pot. It is the perfect dish for warming up in the winter. You can order it with pork or crab. If you’d like to order a combination, it is called yosenabe. Sumo wrestlers eat a type of highly nutritional nabe called chankonabe. A traditional Japanese breakfast includes steamed rice, miso soup, fish, and a variety of side dishes. Some common breakfast side dishes include rolled omelette, natto (fermented soy beans), tsukemono (pickled vegetables), and nori (dried seaweed). Senbei is a type of rice cracker. They come in a variety of shapes, sizes, and flavors. They can be savory or sweet. They are often offered to visiting house guests. They are baked or grilled, traditionally over charcoal. Fugu is puffer fish. If prepared incorrectly, fugu can be lethally poisonous. Only specially licensed chefs are allowed to prepare it. It can be cooked in a hot pot or prepared raw as sashimi. Natto is made from soybeans that are fermented with beneficial bacteria. It is an especially popular breakfast side dish that is eaten with rice. It is most popular in the eastern regions of Japan. It has a unique smell, strong flavor, and sticky texture which takes getting used to. There is a range of dishes with Chinese origin that are very popular in Japan and therefore sometimes mistakenly considered as original Japanese cuisine. Nikuman is a steamed bun that is filled with meat or vegetables. They are very popular at festivals and are also available to quickly pick up at convenience stores during the winter months. Gyoya is a type of dumpling. Usually filled with ground pork and vegetables. The dough wrapper edges are pinched together and then they are steamed or fried. The fried version is often eaten as a side dish with ramen. The Japanese version has a stronger garlic flavor than the traditional Chinese version, which is called jiaozi. This is a combination of tofu, fermented black beans, and minced pork or beef in a spicy chili bean sauce. It is original from the Sichuan (Szechuan) province of China. Yakisoba is pan fried ramen-style noodles. It has bite-sized pork, cabbage, onions, carrots, and yakisoba sauce. It can be served as a side dish or a main dish. It is also popular in Japan to serve it in a long hot dog type of bun. There are a variety of Japanese sweets, called okashi. Many are made with rice flour or glutinous rice. Japanese sweets are often served with tea and have a much more subtle taste than western sweets. Mochi is a rice cake made from glutinous rice. The rice is pounded and then molded into shapes. There are many mochi-based sweets. Most of them have fillings, like a sweet azuki bean paste. There are also many varieties of manju. It is derived from a type of mochi. Most have a filling of anko (red bean paste), which is made from boiled azuki beans and sugar. The outside is made from flour, rice powder and buckwheat. Taiyaki is a fish shaped cake. It is made of pancake or waffle batter, with various fillings. The most common filling is red bean paste. It could also be filled with chocolate, custard, sweet potato, or cheese. Konpeito is similar to Rock Candy, but they are made differently. Konpeito is made by artisans over 7-13 days. It is made by repeatedly coating a sugar syrup over a core of a coarse sugar grain. Over several days the sugar grain grows as syrup is continually applied while the candy is rotated and heated. It turns into a small, colorful ball covered with tiny bulges. Warabimochi is a jelly-like confection. It is made from bracken starch and is covered in kinako (sweet toasted soybean flour). It is similar to mochi but a true mochi is made of glutinous rice. Warabimochi is popular in the summer months, especially in Okinawa and the Kansai region. It is often sold from trucks in the way that ice cream trucks sell ice cream in Western countries. Urio is a traditional Japanese steamed cake. It is also known as uiro-mochi. It is made of rice flour and sugar. It is chewy and subtly sweet. It is similar to mochi. There are several flavors, including matcha (green tea), azuki bean paste, strawberry, chestnut, and yuzu. Nagoya, Yamaguchi and Odawara are known for their delicious uiro. You can buy uiro in traditional Japanese confectionery shops all over Japan. Yokan is made of red bean paste, agar, and sugar. It is a thick, jellied dessert that is usually sold in block form and served in slices. Neri yokan and mizu yokan are the two main types of yokan. “Mizu” means water, so mizu yokan is made with more water. Mizu yokan is often served chilled in the summer. Anmitsu is a traditional Japanese dessert made of small cubes of agar jelly. It is a white jelly made from red algae or seaweed. The agar is dissolved with water or fruit juice. It is served in a bowl along with sweet azuki bean paste, gyuhi mochi (a soft type of mochi), boiled peas and various fruits.